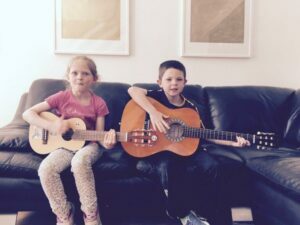 Guitar lessons are an essential part of your child’s learning. There are a huge amount of guitars to choose from for kids, most of which are poor quality, glorified toys. I cannot emphasize enough the importance of not starting your kids out with a super-cheap instrument. It will be harder to play, fall out of tune constantly and only need replaced in six months. Start them off on the right track by choosing a decent guitar from the get-go. Below are a few guitars at different price options which I have personally tested and recommended to dozens of students throughout my 13+ years of teaching. For the smaller child, usually around 6 to 8; I recommend The following guitar as it’s slighter smaller than your standard 3/4 size, but not too small that they’ll grow out of it in a year! You also get a case, picks and spare string which come in VERY handy and save money long-term. If your wee one is slightly taller and/or 8 years old and above – there are two options below. Both are great guitars, but at different price points. The guitar below is a great, really sturdy example which is easy to play and looks great. If you have any more questions about the guitars above, or would like to book a FREE trial lesson, contact me today.